The percentage of undertrial prisoners who remain in jail for more than three months has also gone up from 62 per cent in 2013 to 65 per cent in 2014. On the other hand, Kerala and Tripura recorded the lowest such cases — 35 per cent and 32 per cent respectively. Almost 68 per cent of all inmates in the 1,387 jails in the country are undertrials, according to the latest figures released by the National Crime Records Bureau (NCRB) for 2014. Over 40 per cent of all undertrials remain in jail for more than six months before being released on bail. The percentage of undertrial prisoners who remain in jail for more than three months has also gone up from 62 per cent in 2013 to 65 per cent in 2014. The data looks worse when compared to previous years which showed a declining trend. In 2012, the figure stood at 62.3 per cent. According to the NCRB data, Goa, Jammu and Kashmir, Gujarat and Punjab are the worst performing states, with over 75 per cent of undertrials remaining in jail for over three months. On the other hand, Kerala and Tripura recorded the lowest such cases — 35 per cent and 32 per cent respectively. A large number of undertrials remain in jails due to their inability to secure bail. The highest percentage (27.3 per cent or 63,225 of the total 2,31,962) of undertrials under IPC crimes were charged with murder. Uttar Pradesh reported 17.9 per cent of such undertrials, followed by Bihar at 8.8 per cent. A total of 6,274 convicts were habitual offenders. The NCRB data shows that there were 4,18,536 inmates in various jails against a capacity of 3,56,561. Chhattisgarh (259 per cent) and Delhi (222 per cent) were among those which reported high overcrowding. Muslims continue to form a large share of the undertrial population, with their numbers being disproportionate to their overall population. According to the 2011 census, Muslims constitute 14.2 per cent of India’s population. But the community accounts for 21.1 per cent of all undertrials. 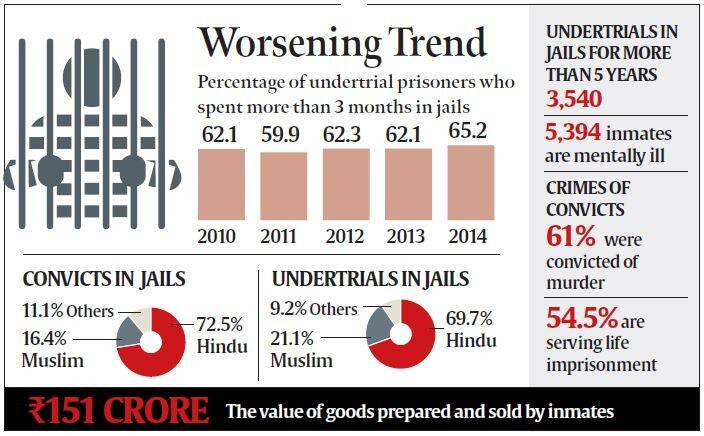 Among the convicted inmates, however, the Muslim share is just over 16 per cent. An analysis of the caste-based classification of undertrials reveals that 37.4 per cent are from general category, 31.3 per cent OBCs, 20 per cent Scheduled Castes and 11 per cent Scheduled Tribes. A total of 318 convicts, including eight women, lodged in different jails were facing capital punishment at the end of 2014. Of these, 95 were awarded death sentences in 2014 alone. As many as 112 inmates had their death sentences commuted to life imprisonment last year. The data also show that 1,702 imates died in jails due to various reasons, of which 1,507 were recorded as natural deaths.